Together with my project, I also was required to write an essay about my work. I chose to write it in English so that more people can have use for it. It got longer than I first thought, exactly 70 pages, but there are many pictures inside it. The plan was to write a little bit about music theory and continue with the practical parts in my work. Basic information about sound and sound waves. General information about string instruments and how to calculate the fretboard. A guide about my work, this is the main point of the essay and include many pictures of the work. The essay lets you get a quick overview of my project, if you want more details please see the work. If you want to learn more I would recommend you to also read what others have to say about these subjects. 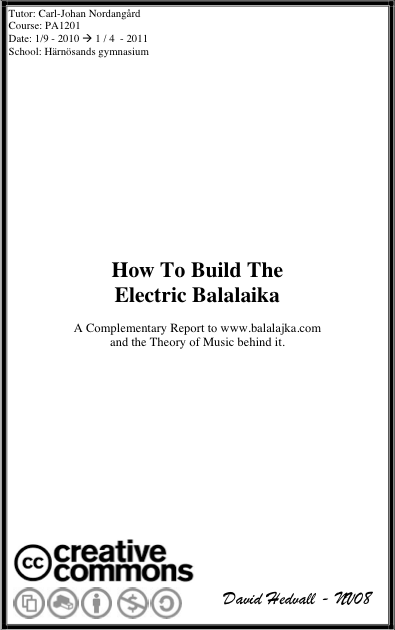 Another tip might be to study how to calculate chords; it is not nessesary for you to know nor understand any of these things if you want to build an electric balalajka, but it might help you when you later play music with it. Click here or on the picture to download a PDF-file of the essay! Here are some sources that have been used for the creation of this homepage and which I have used for the build itself.